Putting a CMMS/EAM solution in place across multiple locations can seem daunting. MPulse Multi-site Implementation Program (MSIP) gets you through planning, data migration, training, and “go-live” day on each site so your processes, reporting needs, data types, and data imports are the same at each location. Then we provide tailored recommendations and follow-up so you can measure your progress against goals. 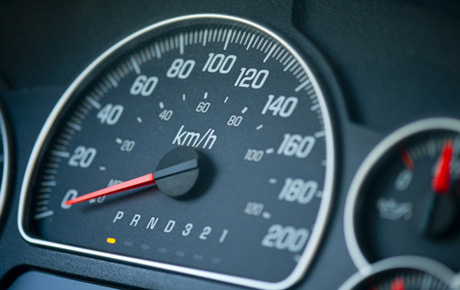 Discover how MPulse can help you minimize disruptions and achieve a faster return on your CMMS investment. 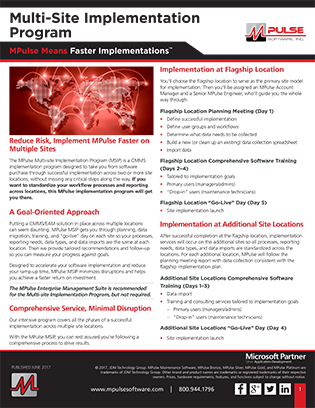 The MPulse Multi-site Implementation Program (MSIP) is a CMMS implementation program designed to take you from software purchase through successful implementation across two or more site locations, without missing any critical steps along the way. If you want to standardize your workflow processes and reporting across locations, this MPulse implementation program will get you there. 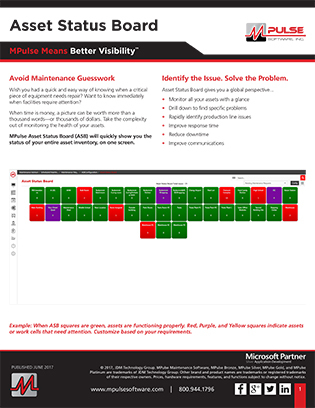 The MPulse Enterprise Management Suite is recommended for the Multi-site Implementation Program, but not required. Our intensive program covers all the phases of a successful implementation across multiple site locations. 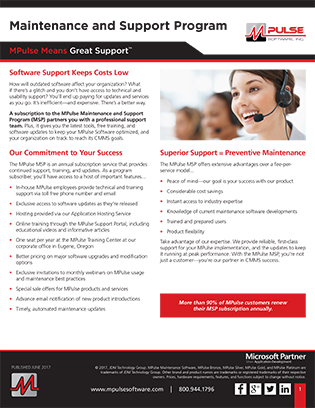 With the MPulse MSIP, you can rest assured you’re following a comprehensive process to drive results. You’ll choose the flagship location to serve as the primary site model for implementation. Then you’ll be assigned an MPulse Account Manager and a Senior MPulse Engineer, who’ll guide you the whole way through. After successful completion at the flagship location, implementation services will occur on the additional sites so all processes, reporting needs, data types, and data imports are standardized across the locations. For each additional location, MPulse will follow the planning meeting report with data collection consistent with the flagship implementation plan.